We could all use a little less stress at work, but for a lot of people that stress leads to serious consequences. 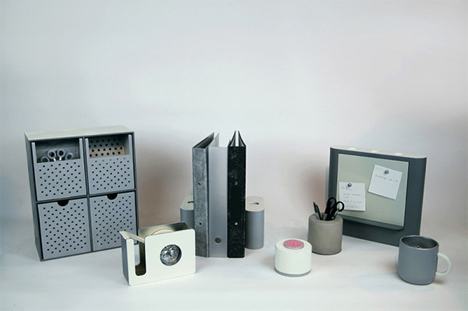 Product designer Tomomi Sayuda knows those consequences first-hand: her father committed suicide in 1995 due to work-related stress. 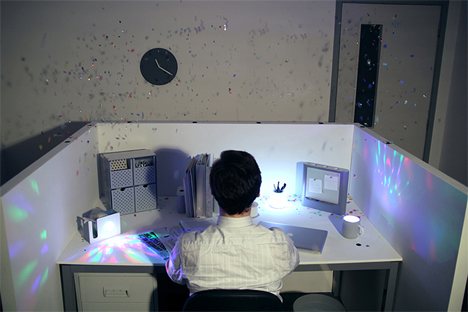 Her Desktop Fireworks installation art is a fun reminder that we all need a bit of a break in the midst of a pressure-filled day. In a moment of mounting stress, the worker pushes the button to unleash a short but sweet stress-relieving party for one. Disco lights flash, confetti shoots up, bubbles waft around, and for a few brief moments the office seems like an ultra-exclusive club and you’re the only one who got in. The installation might be humorous in nature, but it is a reminder to everyone that work isn’t everything. You need to indulge your human side by having some fun during the work day, even if it is just for a few minutes. The effect of this little mini-break can be surprisingly positive on a stressed-out office worker.